A Desperate Tatter: Booties attempt Number 1! My first attempt at the baby bootie and it is dismal. First I missed a whole section on the first corner and I didn't pull the center chains in enough as it doesn't lay flat. Then when I joined the last corner I turned it somehow and unless I cut it apart I can't do anything with it. At least I know what to do when I make the next one. Lessons learned are always helpful. This is made out of Size 20 Flora verigated greens. I like the color. It is just a soft green and will be perfect for the baby no matter what it is. I want to make the booties and an bonnet to match. My oldest daughter is making a crochet blanket out of a green organic cotton. Hopefully the colors will blend together. Time to start attempt number two. Don't worry about it, you'll get there. We ALL make mistakes. Any tatter who tells you that he/she has NEVER made a mistake is either LYING or COMPLETELY UNAWARE of their errors, ROFLOL! It's TRUE! 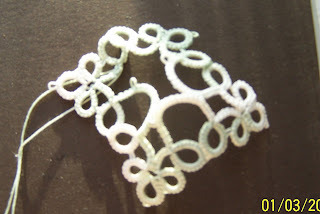 The beauty of tatting is that we really can learn from our mistakes. They truly can make us better tatters. Thanks, Chic, for your kind comments. I am always learning and this is truely attempt at learning a new craft. I know I will get it together.